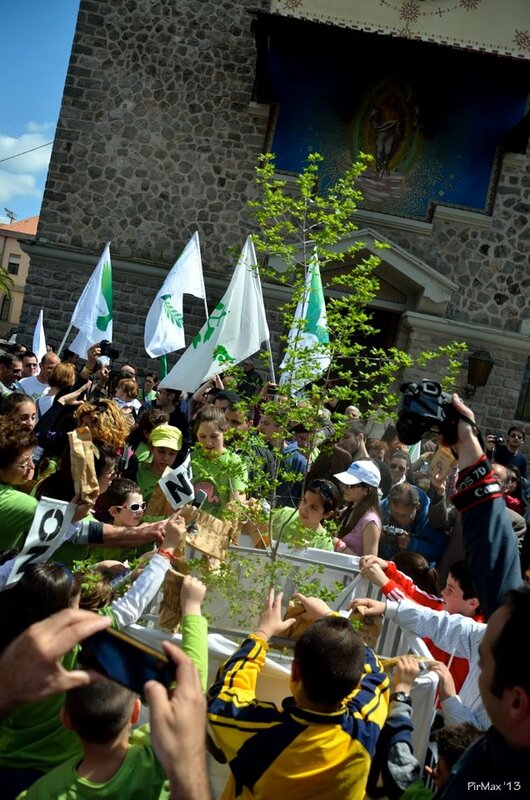 Last Saturday morning (20 April 2013), in Arborea, Sardinia, a thousand people gathered for the Earth March, organized by ProgReS (Progetu Repùblica de Sardigna, a Sardinian separatist party) and the No to Project Eleonora civic committee. This was a curtain-raiser for the following day, World Earth Day, when marches were held across Italy, including Sardinia, about the protection of unoccupied land and fertile ground. Marchers made their protests heard about the appalling loss of soil resources in Italy as land is covered with concrete for housing, roads and other construction work (“soil sealing”). Project Eleonora was authorised by the regional government on 18 December 2009 to prospect for liquid and gaseous hydrocarbons. The work would take place in an area of 171 square miles, near Arborea, one of the biggest cities in the province of Oristano. Its name, “Arborea”, was given originally to describe a beautifully wooded area. Project Eleonora is run by Saras, a family-owned and run corporation, whose CEO is Massimo Moratti, also owner and president of the football club Inter Milan. Saras controls one of the biggest refineries of the Mediterranean, located near Cagliari, the capital city of Sardinia. The refinery is notorious amongst Sardinians for its pollution and for the tragic deaths of a number of workers at the plant. “In the country of Moratti: Sarroch-Italia, an ordinary story of colonial capitalism”, published in 2010, shone a light on the refinery’s activities and was strongly opposed by the Morattis, who threatened to press charges against the author and everyone who tried to speak about it. The project’s name has not been chosen by chance: it has hijacked the name of Eleonora d’Arborea (1340-1404), one of the last and most well-known Sardinian judges, the rulers of the indigenous Sardinian judgeship, its last form of self-government. The activities of Project Eleonora would be likely to contaminate the protected pond of S’Ena Arrubia and the aquifers of the area which serve the city of Oristano, among others. The Civic Committee is also concerned about the potential leakage of hydrogen sulfide, a highly toxic gas found in hydrocarbon deposits, and its effects on the area’s population and its agriculture-based economy. Arborea produces, for example, 98% of Sardinia’s milk. Sardinia already has very great problems with pollution. The Sulcis area of 1700 square miles, well-known for its employment problems, is the largest polluted area in Italy. The island also houses 65% of Italy’s military areas, the most well-known of which is Salto di Quirra, a joint forces range and rocket launching site on the west coast of the island. Quirra is currently under investigation for its effects on ill-health, very similar to Balkan syndrome and Gulf War syndrome: more than 60% of the civilians who live in the settlements closest to the range suffer from leukaemia. With Saturday’s march in Arborea, Sardinian people took a stand. Everyone brought a fistful of earth from their hometown and dropped it into a container holding a maple, symbol of Judge Eleonora d’Arborea. The tree will remain in Arborea’s main square as a symbol of the people of Sardinia’s struggle against yet another attempt to destroy their territory, their lives and their island. This entry was posted in Environment, Health, [en] and tagged No Project Eleonora, pollution, Sardinia. Bookmark the permalink.